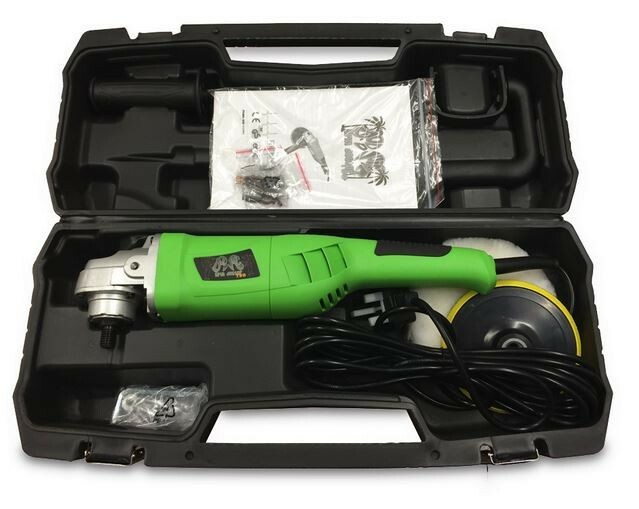 The New Lightweight Spin Doctor Rotary Polisher V2 with Carry Case and Backing Plate. If you really want to flatline swirls, it's time to call in the Spin Doctor. Rotaries can cut paint a lot quicker than orbital machines, so - in competent hands -they can deliver fast and impressive results. The Spin Doctor is a compact and lightweight (1.8kg bare) machine with a powerful 1100W motor and digital speed control. This means a digital LCD display shows your speed to the nearest 100rpm and you can accurately adjust your polishing speed from 1000-3000rpm at the touch of a button. Comes with a side handle, an extra long 5m lead, a spare brush set and a hard carry case. It also has a one year warranty and CE marking. Note that it is M14 fitment and UK spec (3 pin plug, 220-240v).